Keep your beverage at the ideal sipping temperature with this innovative growler. 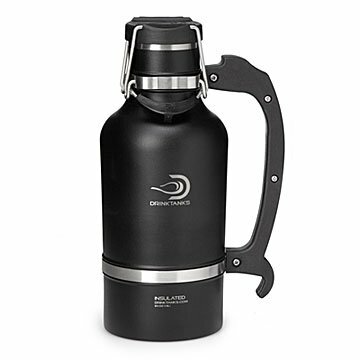 Whether you're having a picnic on a balmy day or enjoying an afternoon at the slopes, your can keep your beverage at the ideal sipping temperature with this innovative growler. An insulated, carbonation-preserving design keeps beer, cider, and kombucha at their crisp, bubbly best for up to 24 hours. And hot beverages, such as coffee, hot chocolate, and hot toddies, will stay piping for up to 12 hours. The growler's body is made from high-grade stainless steel, the same quality of steel that brewers use for their brewing tanks since it prevents leaching of flavors. Its leak proof, dual-bail system ensures the liquid will stay put inside the growler, whether it's laying on its side in your fridge, bouncing around the back of your truck, or being jostled in your bag as you tote it to your next fete. Hand-assembled in Bend, Oregon, using components from China. Dishwasher safe the growler, hand wash the keg kit. Hubby loves this. It is sturdy, the handle makes it easy to carry, and will be great for football tailgates. It is great to have your favorite beer on tap in your fridge. It is easy to over pressurize the growler and get a glass full of foam. There is a line line between too much and not enough. Outstanding quality. Given as a gift to my Son and absolutely loves it ! Still talks about it ! Keg kit is a must have when ordering the growler. It works wonderfully. Great way to get keg quality in small use. The optional keg kit is a must. The only draw back is the kit only comes with 2 CO2 cartridges. You will need more. I found them for about a dollar a piece. Ordered a box of 30. So be prepared for a little additional cost to use this system. Well worth it though! This is the best growler out there! This growler is very nice! Well made, insulated, easy to clean & MADE IN AMERICA!!! The keg kit accessory is awesome! The growler turns into a mini-keg & your beer stays well carbonated & fresh! I've never commented on a product before..but you should buy one of these growlers. We bought 3! Pricey but great product. Especially for those of us that don't finish an entire growler in one day. Good, strong thermos. Overall good product. My in laws home be and this allows them to enjoy a small portion of their brews as if from a pub tap.